FINAL GIRLS is a completely unique, dazzling, white-knuckle ride of a thriller which also shows great depth of understanding about trauma survivors. A "final girl" is a horror movie trope whereby there is a lone survivor of a serial killer's massacre, like Sally Hardisty in The Texas Chainsaw Massacre, Laurie Strode in Halloween, and Sidney Prescott in Scream. 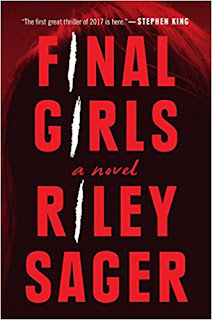 Here Riley Sager turns the device on its head by creating a story about actual "final girls," three women who outlived other victims of three different serial killers. Quincy Carpenter (29), the protagonist, is the youngest. Ten years ago she and her closest college friends went to spend an autumn weekend at Pine Cottage, her best friend Janelle's family cabin in the Pocono Mountains in Pennsylvania. A man, to whom Quincy will only refer to as "Him," killed everyone with a knife -- except for Quincy (who was critically wounded). She was rescued by a local cop named Franklin "Coop" Cooper, who shot "Him" dead. Quincy has Post-Traumatic Stress Disorder, and can only remember the beginning of the massacre to when Coop rescued her. Everything between those two points remains a blank in my memory. An hour, more or less, entirely wiped clean. "Dissociative amnesia" is the official diagnosis. More commonly known as repressed memory syndrome. Basically what I witnessed was too horrific for my fragile mind to hold on to. So I mentally cut it out. 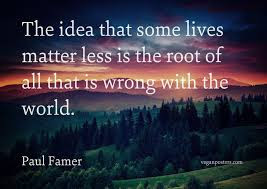 A self-performed lobotomy. Quincy now leads a very ordered, though somewhat solitary life. Her live-in boyfriend Jeff, an attorney with the city's Public Defender's Office, is very loving and supportive. Quincy has a baking blog, a Xanax prescription, and a two-bedroom apartment in on the Upper West Side of Manhattan (bought with money from lawsuit settlements). Because of the heartache of losing her friends, she doesn't allow herself to get close to anyone. She still remains in touch with Coop, her self-appointed guardian. Coop makes the three-hour drive in to see Quincy because he has some news. He tells Quincy that Lisa Milner, the eldest of the "final girls," has killed herself. Quincy is stunned. Lisa (42) had been in touch with Quincy over the years to offer support. Lisa survived a massacre at her sorority house in Muncie, Indiana, and went on to become a child psychiatrist. Only Lisa, Quincy and Samantha "Sam" Boyd (36), who survived a massacre at the Tampa motel where she worked as a maid, know what it feels like to be the only person to endure and outlive their assailants. Samantha went off the grid years ago, so Quincy feels truly alone...until Sam shows up at Quincy's door. These two "final girls" form an alliance which may help--or destroy--Quincy. Riley Sager has written a mesmerizing thriller, and Quincy Carpenter is an unreliable narrator with great complexity. Her trauma has caused her to lose trust in herself. She has survivor's guilt, she has amnesia, and, being lonely and over-medicated, she is easily psychologically manipulated. She spends a lot of effort trying to appear "fine," when she most definitely is not. Quincy, however, is not someone to be underestimated. The narrative is told in two ways. Present-day Quincy is written in the first-person. Scenes from Pine Cottage are in the third-person, which helps maintain the mystery of what really happened ten years ago. The character development and the plot development are subtle yet strong. Nothing is revealed before the author wants it to be, and there are delicious twists and shocks. Sager's pacing is flawless, speeding up during action scenes, and sensitive when dealing with exposition and Quincy's internal monologue. The author clearly knows film history and, with a deft touch, pays homage to classic films like Gaslight, Diabolique, Rosemary's Baby, and Single White Female. 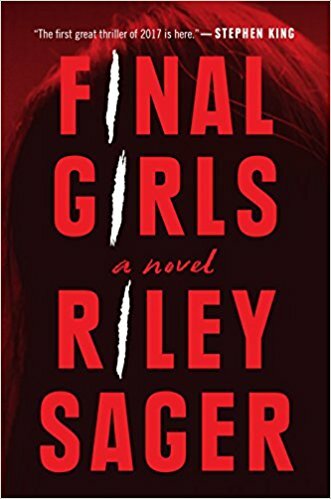 FINAL GIRLS is a true original, and will be the psychological thriller everyone will be dying to read this summer.